This excellent aerial view of the gullies between Seymour Tower and the shore highlights just how deceptive things can be when you walk to Seymour Tower. This is a good reason why you should only walk with an experienced guide, or someone who knows the area well. It is all to easy to not notice the tide racing back in (it rises at 3 inches per minute on the Spring tides). As the tide starts to rise the gullies between the shore and the rescue tower fill first. As a result it is easy to be wandering around Seymour tower oblivious to the fact that you are being cut off. 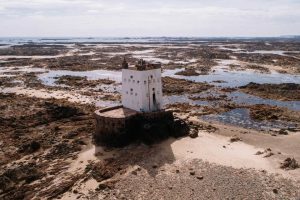 This is because the land around the tower is higher than the land between the rescue tower and shore. Enjoy this remarkable place and take care. 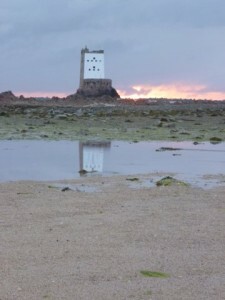 Or, join us on our guided walks on the seabed to Seymour Tower. Our organized day stays are ideal for people who may not wish – or don’t have the time – to spend 24 hours at Seymour Tower. Dates: July 19, August 7, 18. Details. 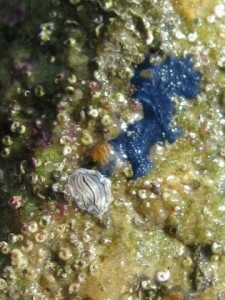 Far better photographs are on Rudolph's blog! From time to time we get visiting journalists, travel writers and professional photographers visiting Jersey who plan to write or produce photo articles about our walks on the seabed (also called Moonwalks). Personally, I find the term “Moonwalk” misleading. It makes people think we either walk in the dark (possible and different- but you can miss a lot), or the area is barren and devoid of life. The South east coastal Ramsar site of Jersey is a remarkable and diverse area which is full of surprises. I guess this is the reason I keep exploring the rocks, gullies and sand bars and have lived within yards of the beach for over 40 years. 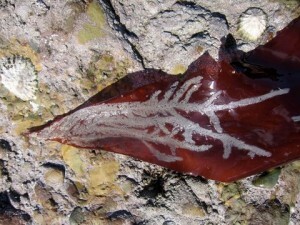 I even get seaweed landing in my garden and sometimes gather some Pepper Dulse to use when cooking. Anyone who has been on our guided walks will realise just what a remarkable place this bit of ‘seabed’ is to explore with huge 12.5m tides and masses of different rock formations and marine life. Just to add a bit extra there are Oyster beds and, better still, our ancestors built Seymour tower to give people a destination when walking in the area. Well not really, Seymour Tower was built as a coastal defence against French attack in 1782. Rudolph Abraham, a professional photographer and award winning travel writer, has captured some of the feelings for this area in his excellent photo blog while attending the Outdoor Writers and Photographers Guild conference (OWPG) in Jersey. Take a look.